With the launch of RAD Studio 10.1 Berlin, Delphi, C++ Builder, comes a new component, TAddressBook, that enables easy access to the Address Book on iOS and Android. The TAddressBook lives under Services section of the tool palette and consists of two and has very little in the way of Component properties. It does however have two events that are very useful, and a number of run time methods to call. The two events provide notification when the address book has been changed (outside the application) and the result of the application asking for access to the address book. The request for Permissions is different on Android and iOS. On iOS, the OS asks the user via a dialog if they want to allow access. On Android, you need to set the permissions with the application and they are confirmed by the user to install the application. If you forget you will get a denied response. 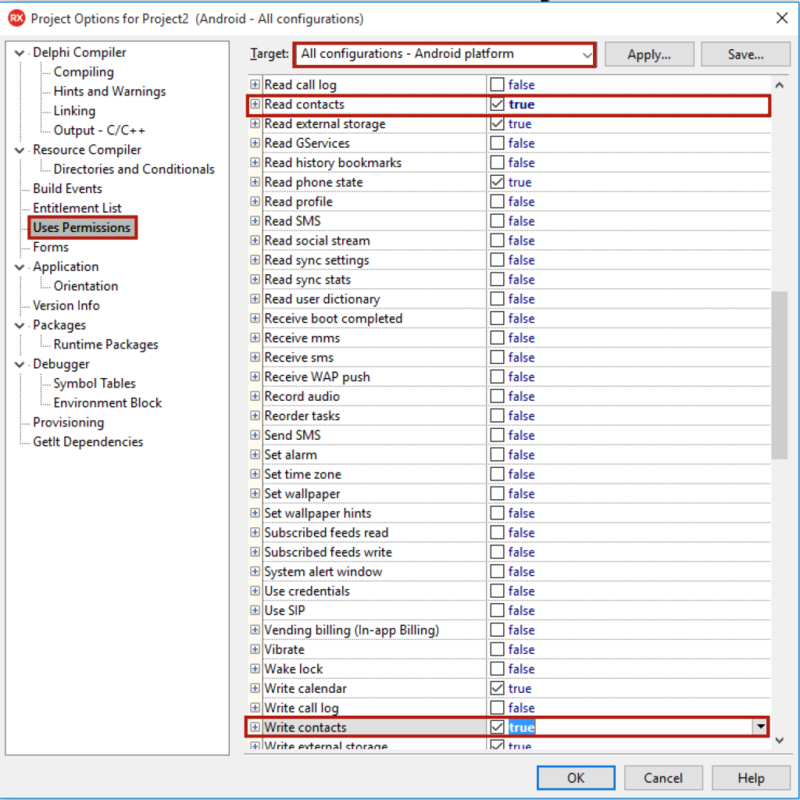 To setup the manifest with permissions on Android, open the Project > Options and under Uses Permissions, select All configurations for Android near the top of the list and enable Contacts Read / Write as required for your application. With permissions setup completed on Android (we will have to wait for the user to do it at run time on iOS) Its time to write the first line of code – This will ask the address book to check it has Permissions to access the address book. Obviously, you can do it where you want, but using FormCreate is a sensible place to easy ask the AddressBook to request permissions as you can then use the resulting method to update the UI accordingly if you have access. With the address book access confirmed for TAddressBook, we are now safe to call the address book to read / write to the contacts. The address books on mobile have concepts of sources and groups (which seem to be used differently depending on iOS / Android and if you have used iCloud to add people or your phone etc..) Contacts can either be fetched completely or via a specific group. Create a TAddressBookContacts object to manage the contacts fetched. Do something with the TAddressBookContact instances returned into your TAddressBookContacts instance. You can look up TAddressBookContact to see how the contact details are structured, or you can use code completion. 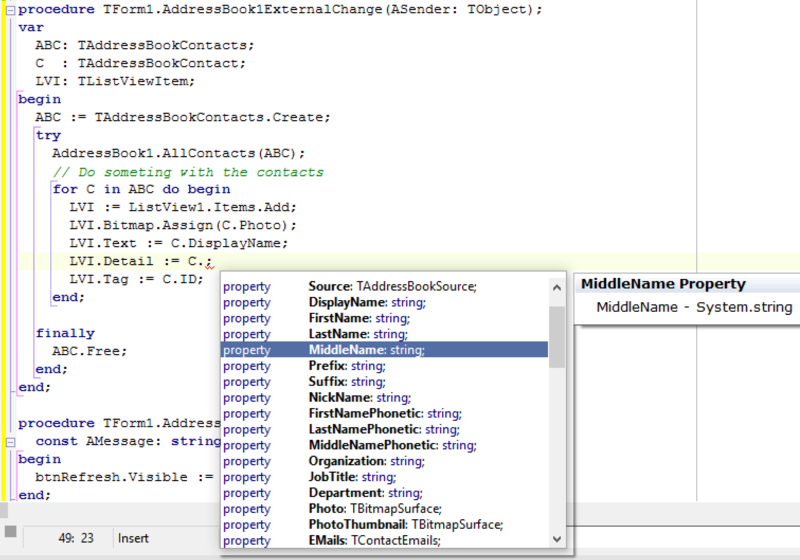 Phone numbers are listed as an array and you can see from the code completion the complete list of properties. TAddressBook.ContactByID (passing in the ID integer).